Erythritol is an artificial sweetener; chemically it is a sugar alcohol, so it belongs to carbohydrates. Erythritol, which does not need to be digested, is quickly absorbed in the small intestine, is poorly metabolized, has no known functions in the human body and is excreted through the urine unchanged. Erythritol is semi-artificially produced by fermentation of glucose, derived from wheat or cornstarch, by using non-pathogenic yeasts like non-GMO (not genetically modified) Moniliella pollinis or Trichosporonoides megachilensis [1,2-p.153]. Erythritol is made of glucose with added hydroxyl (OH) groups . Erythritol is naturally present in insignificant amounts (up to 0.2 grams per serving) in pears, melons, grapes and mushrooms and in yeast-derived foods such as wine, beer, sake, soy sauce and cheese; it is also present in the human body [2-p.152;3]. Semi-synthetic erythritol can be used as a non-caloric sweetener in tabletop sweeteners, fondant, candies, chocolates, ice cream, chewing gums, dairy products, baked products, yogurts, jellies, fillings, jams, coffee syrups, soda, energy drinks, vitamin water and also in lozenges [1,4]. On the food labels in the European Union, erythritol is labeled as E-number E968 . More than 90% of erythritol is usually quickly absorbed in the small intestine; erythritol is poorly metabolized and is eliminated unchanged with the urine [2-p.159]. When erythritol is consumed in amounts found in the usual food serving sizes, a small amount of the unabsorbed erythritol can pass to the large intestine where it is, unlike other sugar alcohols, not fermented by the normal large intestinal bacteria, so it is excreted unchanged with the feces and does not likely cause abdominal bloating [2-p.160;4,6]. Erythritol provides only 0.2 kilocalories per gram and is considered a zero-calorie carbohydrate sweetener [2-p.59]. Erythritol has zero net carbohydrates. Can erythritol be good for you? Erythritol has very low glycemic index (GI = 0); consumption of 1 g erythritol/kg body weight does not raise blood glucose and insulin levels, so it may be suitable for diabetics [2-p.174;4]. Erythritol has a “low” effect on the insulin release [7,10]. Erythritol is not fermented by the mouth bacteria, so it does not promote dental caries [2-p.161;4]. Erythritol does not cause gas, so it may be suitable for individuals with irritable bowel syndrome (IBS). Erythritol is Generally Recognized As Safe (GRAS) by the US Food and Drug Administration (FDA)  and has the “Acceptable Daily Intake (ADI) not specified” status by The Joint Food and Agriculture Organization/World Health Organization Expert Committee on Food Additives (JECFA) . It is also approved in the EU, Canada, Australia, Japan and many other countries . Currently there is no evidence about erythritol as a risk factor for liver or other cancers. There is no evidence about harmful effects of erythritol for the fetus, but insufficient research has been done to state its safety during pregnancy. When consumed in excess, the unabsorbed erythritol can attract water from the intestinal wall and cause diarrhea (an osmotic effect). The laxation threshold of erythritol in healthy men is 0.66 g/kg and in women 0.8 g/kg body weight or 50 grams in a single dose by a 160 lbs man or 140 lbs woman [2-p.161] or at least 15 grams in 4-6-year-old kids  and probably more than 1 g/kg/day or about 75 grams per day by a 160 lbs person [2-p.160]. For example, a 3.5 oz (100 g) chocolate or nine hard candies may contain 60 grams erythritol . Erythritol is not permitted in beverages in the EU because of its laxative effect that may occur at doses around 25 grams . Erythritol consumed along with fructose increases the risk of diarrhea, so it does not seem to be appropriate sweetener in fructose malabsorption, as previously suggested . Erythritol in large doses can cause abdominal pain and headache . Erythritol can trigger allergic reactions in sensitive people . It is 70% as sweet as sucrose [2-p.151;4] without odor and with a clean sweet taste; when it remains in the crystal form, like in chocolate, it has a strong cooling effect in mouth, but when it is dissolved, like in soft drinks, the cooling effect is lost [2-p.154;3]. It does not decompose even at 356° F (180° C) [2-p.155]. Solubility in water at 77 °F (25° C) = 37 g/100 g solution [2-p.158], which is lower than that of sucrose, but it reaches sucrose solubility at higher temperatures [2-p.155]; slightly soluble in ethanol and insoluble in fats . According to some producers, erythritol does not caramelize, but according to some cooks, it does. Erythritol does not undergo the Maillard browning reaction with amino acids . Yes; erythritol is usually produced from wheat or cornstarch. Yes. Erythritol can be derived from wheat, but it should be gluten-free. 3. How is erythritol different from stevia, sucralose, xylitol and dextrose? Erythritol has almost no calories and does not cause bloating. Xylitol has about 2 kcal/g and can cause bloating. Sucralose has no calories and causes no bloating. Dextrose (glucose) has about 4 kcal/g and causes no bloating. 4. Is erythritol a FODMAP? Unlike other sugar alcohols, erythritol is not a FODMAP, because it is not fermentable so it may not be bad for you if you have irritable bowel syndrome. 6. Does erythritol promote the growth of intestinal candida? Erythritol cannot be fermented by candida, so it does not promote its growth. 7. What is organic erythritol? Erythritol that meets the “USDA organic” certificate criteria is available on the market. 8. Is there any substitute for erythritol? When you do not have erythritol available, you can try other artificial sweeteners, such as stevia or sucralose. Viola, erythritol should not be problematic for diabetics. It is completely absorbed in the body and then it is practically completely excreted without doing anything. It has only 0.2 Calories per gram (sugars have 4 Calories per gram). Please explain to me why erythritol is not ketogenic. Thanks. Cammy, in the human body, ketones can be produced from fatty acids and ketogenic amino acids, but not from erythritol. 1. Itchy spots and nausea after eating something certainly can be due to an allergic reaction. 2. Allergic reaction to erythritol has been reported here, but I think it’s rare. 3. To know if you are allergic to erythritol, you would need to have some test performed by an allergologist. 4. If other foods with erythritol result in a similar reaction, it’s more likely you are sensitive to it, but if not, it’s much less likely – in this case you might be allergic to some other substance. My son just got home, broken out from head to toe, after drinking this crap! He is an adult and trying to avoid sodas. cocofusion has many ingredients other than erythritol – including steviol compounds of all things! So Erythritol is not a prebiotic, correct? It passes through without doing anything except absorbing water. Erythritol is not a prebiotic because it is practically completely absorbed in the small intestine and does not reach the large intestine, where other prebiotics can feed the intestinal bacteria. So, it does not pass through the intestine and absorb water but it is absorbed into the blood and then passes through the body without doing anything, as far as I know, and is excreted unchanged in the urine. 10% of normal doses of erythritol reaches the lower intestine where it is fermented to VFAs by the gut flora and perhaps it provides nutrition to them – however, perhaps it kills them. Would have to look for more info from scientific experiments on humans but that 10% is listed as providing 2 calories per gram as if half of that (5% of the original does) were converted to energy to the gut flora. VFAs typically help the human gut–especially butyrate. Erythritol is a butyl-polyol so a simple fermentation process could produce a large proportion of butyrate – I’ve been unsuccessfully looking for info about that but there’s lots of reasons to be enthusiastic about this foodstuff conditional on everything checking out. Erythritol probably has about 0.2, not 2, Calories per gram. You decide….some say it’s made from sugar, others there is a cornstarch implication with GMO’s. Others are filing patents because it is so effective in killing fruit flies. Should we even be ingesting this new miracle wonder sweetener…. 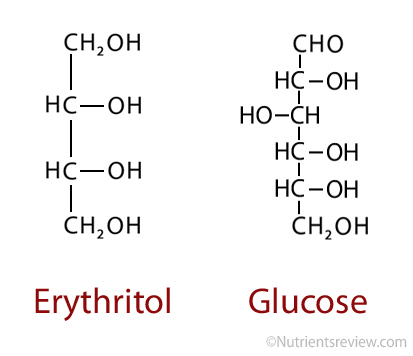 Erythritol is semi-artificially produced by fermentation of glucose, derived from wheat or cornstarch, by using non-pathogenic yeasts, like non-GMO (not genetically modified) Moniliella pollinis or Trichosporonoides megachilensis. Practically all sugar alcohols, such as sorbitol and mannitol, have a laxative effect in certain doses. There are certain foods that certain animals cannot safely eat, for example, dogs should not eat chocolate. The fact that erythritol might be GMO-derived or that it has a laxative effect or kills insects, does not already make it dangerous for people. As eyrithritol is a simple organic molecule and refinement is extremely easy and cost-effective (after the initial production) it doesn’t matter in the slightest to its value or risk as a foodstuff whether the grains that produced the starch fed to the yeast was GMO or not. I’m not sure what is your claim here. I read an article saying that erythritol has been known to cause urinary problems such as incontinence. I’ve been using great amounts of trivia which has erythromycin in it. Have you heard anything about this? Can you link to the article? I think you might have inadvertently omitted the stevia comparison. Please could you do so. I am interested to know more about stevia because I have a plant. I know that it is a herb, I have it growing in my garden for 5 years now. It is completely dormant in winter and then apears again in spring. The stevia extract that’s licensed for sweetening in the UK at least is a steviol compound. steviol is mutagenic and in sweetened foods it’s only modified by the presence of four glucose units. I’m steering well clear until and unless I find out that the glucose units remain present until the molecule reaches a peroxisome and is broken down completely in there – I don’t consider it “clean food” myself. Can you refer to some source that says that steviol is mutagenic? I recently (past 12 months) discovered and began to enjoy a drink containing both erythritiol and stevia but after just a few weeks,m began suffering pain in my rotory cuff. It appears I may have a deposit there pressing on one or two nerves. After weeks of therapy and a dozen or more massages, with no satisfactory results, I stopped using the drink and within 24 hours, the deposits began to shrink & disappear. Any comments? I wrote 3 days ago regarding pain in the rotary cuff that had been plaguing me for 10 months and despite much medical advice, therapy, and over $800 in massages, nothing worked. Then it occurred to me that the problems began about 3 months after purchasing and using daily a drink that contained both erythritiol and stevia. Otherwise, my diet remained the same during those 3 months, so I decided to stop that particular product. Amazingly, within 24 hours the pain and deposits (?) felt by my masseuse began to disappear. Now each day I notice continuing improvements in movement while using that shoulder. I am a bit disappointed that I have heard nothing back or suggestions from your commentator . I don’t see a direct relation between stevia, erythritol and pain in the rotatory cuff. It may be a coincidence. Erythritol in large doses can cause headache, but this does not sound similar to what you said. Theoretically, it would be possible that you are sensitive to one of the components of the product you used. I’m a weight-restricted athlete. Before every meet I need to flush out ~6pounds of excess water to make weight. I read that erythritol is eliminated via urine. Will it help to reduce water weight? No, not likely. To flush water out of your body, a substance would need to be a diuretic, but erythritol is not. What are the dental benefits of erythritol? Erythritol is not fermented by the mouth bacteria, so it does not promote dental caries. So, theoretically, using erythritol instead of sugar may help prevent caries. I’m not sure how true is this in practice.